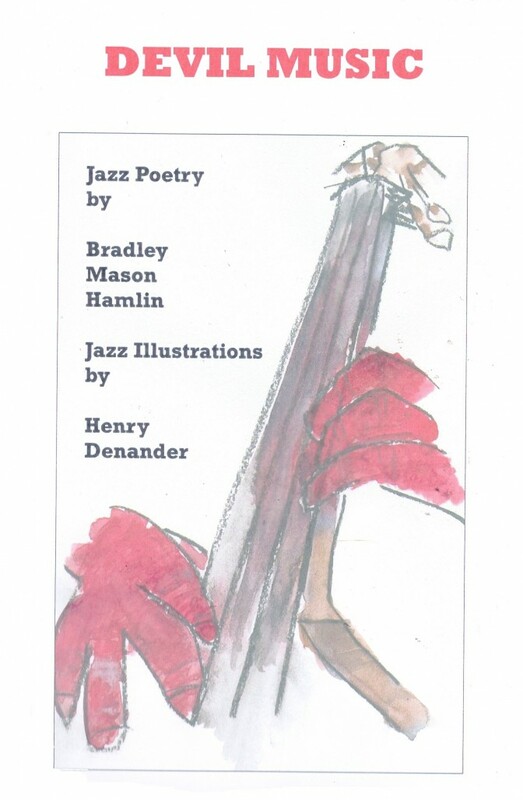 I've done the cover and all the illustrations to Bradley Mason Hamlin's poems. 12 Gauge Press was actually the first publisher who wanted to publish my work. I had bought a lot of books from Gary Aposhian at the press and he wrote me to say he liked the small drawings and doodles I made in my letters to him and he asked me if I wanted to illustrate this book. Then it took many years for it to be published but that's another story. 32 pages of poetry and artwork inspired by and in tribute to great artists such as Buddy Bolden, Louis Armstrong, Dizzy Gillespie, Zoot Sims, Miles Davis, Billie Holliday, Charlie Parker & others. "Hard-knuckle Bukowskian jazz poetry that brings them all back, Miles Davis, Billie Holiday, Thelonius Monk, Charley Parker, etc., and the whole jazz epoch that they produced and that produced them." illustrations of the foremost artistry and individuality."